Miners' oilwick cap lamps were used in the U.S. from the 1860s into the early 1920s, with the first patent for a miners' oilwick lamp granted on May 13, 1862 and the last patent granted on Apr. 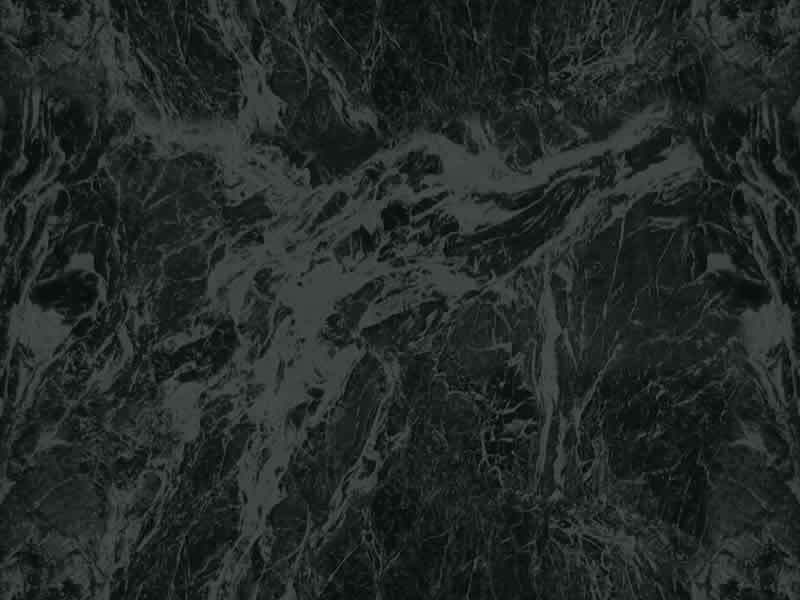 20, 1915. These lamps were divided into two main categories, face lamps and driver’s lamps. 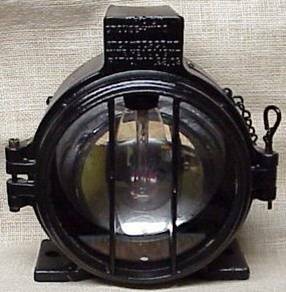 Face lamps were the smaller lamps worn by miners at the working face, a smaller and more confined working space. 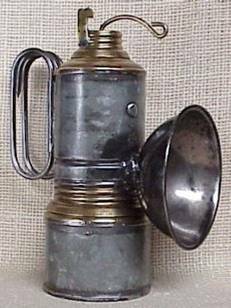 Driver’s lamps were the larger lamps worn by mule drivers and others working in the drifts where more light was needed and where a greater chance of the air currents extinguishing a smaller flame existed. 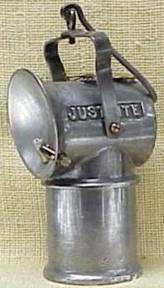 The open flame produced by these lamps was inherently unsafe before efficient ventilation and gas detection methods reduced the chances of methane explosions. The coal miner had to purchase his own fuel so he used anything that burned. Miners were known to scrape axle grease from the coal car wheels and mix it with kerosene to stretch their fuel, but this gave off a dark sooty smoke that contributed to poor air quality underground. Shown here are a Davy-style Lamp, un-bonneted Clanny-style Lamp and a bonneted Clanny-style Lamp with a Beard-Mackey Sight Indicator to measure the percentage of methane gas present. The danger of methane gas (firedamp) being ignited by an open flame in coal mines was greatly reduced through the development of the flame safety lamp by Sir Humphrey Davy, Dr. William Clanny, and George Stephenson. Davy is credited with the true invention of the flame safety lamp in 1816. His idea was to isolate the flame from the flammable gas by means of a wire gauze surrounding the flame. Davy demonstrated that burning gases, on passing through the wire mesh, are broken up into tiny streamlets which are so cooled by contact with the metal of the mesh that the flame is extinguished. It was found that the greatest safety could be obtained by a standard mesh formed by 28 steel wires per inch making 784 openings per square inch. The invention of a reliable flame safety lamp, along with improved ventilation systems and practices were a major boon to the coal mining industry world-wide. 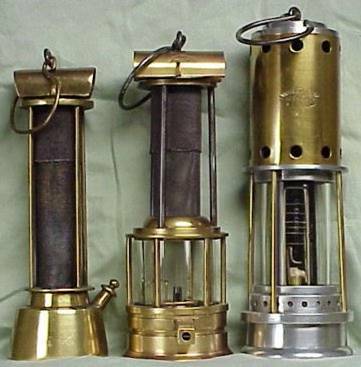 Beginning in the first decade of the 20th century carbide lamps began to replace oilwick lamps. Carbide lamps burn acetylene gas produced by a chemical reaction between water and calcium carbide. The water chamber sits above the carbide chamber and water is dripped into the carbide. The flame is controlled by regulating the water released, and thus the amount of gas produced. The earlier models, such as the Baldwin lamp on the left, were rather crude in their water regulating abilities. As time progressed the water “dropper” system was improved with a variety of needle valves. The second lamp from the right is a Kentucky product manufactured by the Ashmead Manufacturing Co. of Ashland, Kentucky. 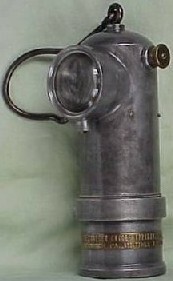 These lamps had to be recharged several times during each shift, requiring the miner to carry extra carbide and water. The early carbice lamps had to be lit with a match while later lamps had strikers on the reflectors. 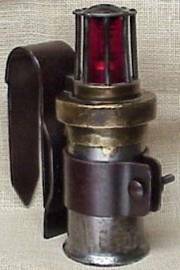 Carbide lamps gave off considerably more light than oilwick or safety lamps but were still open flame lamps. It was the development of reliable electric mine lamps that were to provide the safest light underground. 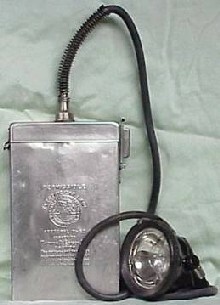 Carbide hand lamps were carried to the mine worksite and hung to provide light while cap lamps were attached to the miners' helmet or cap while they worked. Being larger, the hand lamps provided more overall light at the work site while the cap lamp provided more intense directional light for the miners. The hand lamps could also burn for up to eight hours on a single charge of carbide. Hand lamps never became popular with coal miners due to their higher cost and inability to provide focused light at the working face, they were used more extensively in the western hard rock mines. The first electric mine hand lamp was patented in the U.S. on Oct. 29, 1889, five years after the same lamp was patented in England. The Philadelphia & Reading Coal Co., Lehigh Coal & Navigation Co., Lehigh Valley Coal Co. and Colorado Fuel & Iron Co. experimented with electric hand lamps as early as 1902. In 1912, Thomas Edison began experimenting with a miners’ rechargeable storage battery cap lamp. His lamp was advertised and on the market by 1917 but wasn’t submitted for patent until 1923 and the patent finally issued in 1928. This lamp became the standard for all electric cap lamps to follow, not just in the United States but throughout the world. It featured a headpiece attached by a cord to a storage battery carried on the miner’s belt. This lamp was capable of lasting the entire shift before being recharged. The lamps used in coal mines today follow this same basic design.